It's November, which means it's time to grow your mustache, raise awareness and funds for men's health. So which Movember style will be yours this year? As this blog grows from it's infancy, new things are being learned every week. Last week, I learned that it's unwise to make predictions that are heavily weather dependent. (i.e. Matt Ryan's aerial assault of the Eagles.) Baring a few hours notice, stay away from long term weather forecast when considering possible outcomes. Let's rebound and strike it rich! Make sure to follow my homey @norin_ondeck's in game banter and check out his weekly From the Gut pick in the comments section below. A lot of people have written off the Ravens after the injuries to Ray Lewis and Ladarius Webb. Coming off the bye week, the Ravens will be well rested and motivated to prove their critics wrong. It's unacceptable for a team with a talent like Ray Rice to be 30th in the NFL with 22.1 rushing attempts per game. Hopefully Ravens OC Cam Cameron used the bye week to gather some sense. The Browns are 23rd in the NFL allowing 4.4 YPC (yards per carry). If the Ravens are smart enough to run, they should be able to run freely against their opponent this week. With Terrell Suggs two weeks healthier, look for the Ravens to put Brandon Wheeden under pressure, forcing errant throws or turnovers. Now the question is how the Ravens fare in stopping Trent Richardson. Last time these teams met, Richardson only rushed for 47 yards in 14 carries. With an extra week of preparation, the Ravens will keep T-Rich under 100 yards rushing and cover the spread. Recap: Baltimore went up early and they thought they could just coast through. Ray Rice was very good and he was used more effectively in this game. Although the Ravens allowed over 100 yards to T-Rich, they kept him away from the end zone and ensured a win. The Bears have taken care of business against inferior teams, except for last week coming off a short week. Chicago has won their games by an average of 16.3 points. The Bears will be able to shut down the Titans biggest strength: their running game. The Bears allow a paltry 3.8 (YPC), 8th in the NFL. And if the ageless wonder Matt Hasselbeck is forced to throw excessively against this D, the Titans day will be very long. The Bears should be able to move the chains with ease on offense. The Titans D has not been particularly impressive stopping neither the run nor the pass. With a healthy Matt Forte and the duo of Cutler and Marshall, the Bears will score sufficiently to beat the Titans. After a close call last week, the Bears will be sharper this time around, even in a non-conference match up. Recap: The Bears came out strong against a lesser opponent and their D was dominant once again. The comfort level between Cutler and Marshall and Matt Forte's talents also make this offense a dangerous one. I like them this week against the Texans. More on this to come. Matthew Stafford looked more comfortable with Ryan Broyles and Titus Young than he did with Nate Burleson. Both Broyles and Young are athletic wide receivers that give Stafford some solid options beyond Megatron. Although the Jags have a solid good D allowing only 6.8 yards per pass and 4.2 yards per rush, look for Stafford to continue playing at a high level this week. The Jaguars will once again miss the explosiveness of Maurice Jones Drew on offense. Rashad Jennings who rushed for 59 yards in 17 carries last week simply isn't on the same level as MJD. Additionally, if Ndamukong Suh can get some pressure on Gabbert, this one will be over early. I like the Lions by a touchdown in this game. 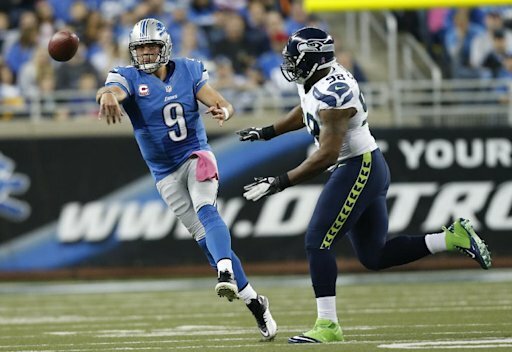 Recap: Matt Stafford once again looked like the Stafford of last year. Even though he didn't throw a touchdown in this game, he was accurate and efficient. The Lions will be a dangerous team if they can establish a running game and get healthier on defense. The early season shenanigans by coach Greg Schiano brought his team closer and they're playing with a 'us vs. the world' mentality this season. The Bucs have been competitive in every single game this season. All their losses have been by 7 points or less, even with a tough schedule so far. Ever since the bye week, the Buccaneers offense has been in sync with key contributions from Josh Freeman, Doug Martin and the receivers. Look for the red hot Freeman to continue his hot streak this week. To be fair, the Raiders have also been playing better since their early bye week. Unfortunately for them, the Bucs allow a league best 3.5 YPC, so McFadden will be kept quiet. Oakland is also 3-6-1 ATS in its last 10 games at home. Even though I expect a good day from Carson Palmer, the Bucs will be able to keep up with the Raiders and win a close one on the road. Don't get me wrong, both these teams have their concerns. However, I'm taking the Saints here because they have less issues than the Eagles and because someone named Drew Brees plays for them. The Saints defensive struggles have been well documented so far, but not all hope is lost. With an extra week to prepare with the return of their DC Steve Spagnuolo, the Saints will have a game plan to slow down LeSean McCoy and Michael Vick. More importantly, with the added pressure on Andy Reid and Vick, the Eagles will play conservatively to limit turnovers, allowing the Saints to take an early lead. The Eagles will be under pressure to score throughout the game, which ultimately will result to more turnovers for them. Look for Drew Brees and the Saints to win a high scoring affair. Recap: Although I was expecting a higher scoring game, the outcome was predictable in this game. The Saints are simply a better team at the moment. I honestly felt bad for Michael Vick. The Eagles O-line inadequacies are shocking and until they fix it, you must fade the Eagles. Beautifully put Norin! As it happens so frequently, our picks clash again. Love the FTG concept btw. Hello everyone, my good friend Omar has done a fantastic job with his respective betting section "Tossing Horseshoes", I have decided to join the party and add another section of this wonderful betting blog page and hope to continue for the rest of this season, and many more too come. The podium picks will be based on the same concept as our friends at The Score use. I will provide you with three different picks each week ranking them from my strongest pick to my lowest pick (Gold being the strongest, Bronze being the weakest). I tend to bet 3 game parlays and the the picks I provide here are also the picks I place my real money on. That being said lets get to my bronze, silver and gold pick of this week! The news of Ryan Tannehill having only a 50-50 change of starting this week after his knee had been drained twice at practice has swayed my opinion on this pick. Although Matt Moore is a serviceable backup, both he and a less than 100% Tannehill I think will struggle against an underrated Indianapolis defense. Home field advantage never hurts and with Andrew Luck hitting his stride I see the Colts upsetting the Dolphins with an overtime victory. This pick hurts to make since I am a Raiders fan, but one of the cardinal rules of betting is to never let your biases and emotions make your picks. That being said I do see this being a close game with both Offenses beginning to hit their stride and both defenses struggling throughout this season. In a must win game for both teams, give me the team with the more balances attack and the better rush defense (since both pass defenses are pretty brutal). I see this being another long day for DMC owners as the Raiders will struggle to run the ball and fall behind, forcing them into an aerial game. Look for Doug Martin to have another solid day on the ground regardless of the loss of his All-Star LT.
Im all aboard the Broncos bandwagon and love what i have seen from the team the past couple of weeks. The have all the tools on both sides of the ball to compete for a Super Bowl this year, and the only thing that was holding them back earlier in the season was the lack of chemistry Manning had with his All-Star wide receivers, and his weaker arm strength (which was expected after missing a year of football). Now Manning looks like the old Manning and the Broncos have been clicking on all cylinders on both sides of the ball. Look for Champ Bailey to cover Aj Green all night and remove the only legitimate offensive threat the Bengals have at the moment. The running game is pitiful and Andy Dalton doesn't have many weapons to choose from, although Jermaine Gresham could have a sneaky good game. Give me the hotter team even though they are on the road. Thats my picks for this week. Good luck with your bets and I'll see you all next week. Good stuff Sots! Look forward to the weekly installment of these podium picks. I also like your picks, but I'm slightly hesitant about the Colts. I do expect a really close game though. I'm with you on your picks except for Ravens at Browns. I think Richardson will put up good numbers against the Ravens D and Joe Haden will be prowling on defense causing problems for Flacco he didn't have during their first meeting. I consider the Eagles at Saints game a flip. I just can't trust the Saints D, and the Eagles have alot of offensive firepower if they can get going. I also changed my website around so all pages are blogs allowing for comments. Thanks for that bit of advice. I also plan to begin posting a small discussion for each game in Week 10 explaining my picks much like what you are doing. The Ravens Browns game should be a good contest. We'll see what happens. I noticed that we had very similar picks this week. Let's strike it rich! Posting small discussions for your picks give the audience a better understanding of your picks. But if you do it for all your selections, it is a lot of work. But if you're up for it, that would be great. Good Luck to you too Smith! I came out of this weekend undefeated on my money bets. (I'm glad I didn't go against your pick for the Browns-Ravens game. lol) Looks like you are off to a great start with one game left. I will be rooting for the Saints to cover tomorrow night. As for the discussions, I "borrowed" Sots idea of podium picks. That will give me three main games each week to focus on. Congrats Smith on a winning Sunday! A lot of people liked the Ravens, and the game was much closer than the scoreboard might suggest, but I'll take it! The 'podium picks' idea is very cool with a focus on your top 3 picks. I just hope you don't call it 'podium picks' because Sots himself came up with that name. I meant a lot of people liked the Browns. 1) BENGALS +5.5 vs Broncos. All signs point towards Manning picking apart the Bungals D. So lets throw some lettuce on the Cats. WHO DEY. 2)Texans vs Bills OVER 48. Fantasy Football shootout, everyone WILL get a touchdown. 3)VIKINGS +4 @ Seahawks. Two very similar teams. My heart says it'll be a close game, my knee says AP is gonna go OFF. 4) EAGLES +3.5 @ Saints. I turned to my Football Guru brother James' for advice on this game. "Weren't the Eagles in the Super Game last year?" Good enough for me. Show me some love Philly! Tough going today Adam. To be honest, I liked the 'OVER' call in the Bills vs Texans game and the Vikings at +4. Hope to see yo back here next week, come back strong.